CAMPFIRE – the coffee table with the large, round glass tabletop is perfect for convivial get-togethers and creating that ‘campfire ambience‘. Positioned on top of and wedged into one another, the three beams evoke the romanticism of camp-fires in a slightly tongue-in-cheek manner. The design reflects down-to-earth values and solidity. 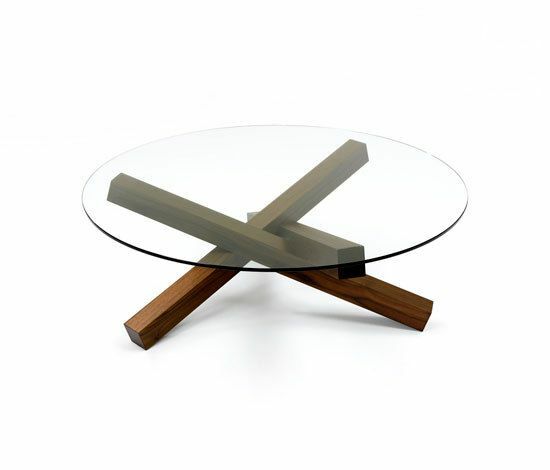 In doing so, every aspect of the design also expresses a simplicity that gives this table a timeless quality. CAMPFIRE – the coffee table made from three striking timber beams in the following versions: solid natural oak, black or stained as desired, as well as solid black walnut (American walnut). Glass tabletop in three standard sizes (Ø 110, 123 or 136 cm) with a straight or bevelled glass edge. Glass support (bevel) is covered with slip.